The shape, size, depth, and material their bowls are made of can matter to and impact your cat. Some materials are more durable and less likely to harbor bacteria. And, of course, every cat is different and may have different preferences for the size, shape, and depth of their bowls. But here are some general guidelines to help you make the best decisions when you're faced with the (often) overwhelming options of cat food and water bowls. 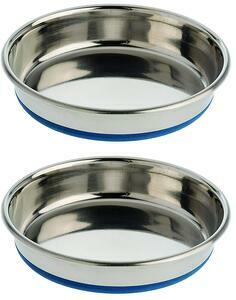 In most cases, stainless steel is the best material for cat food and water bowls. It’s easy to clean and disinfect, and extremely durable. Glass and ceramic dishes are also easy to clean, but can chip, crack, or break more easily. And any chips or cracks can lead to cuts on your cat's tongue, paws, or chin, or provide areas where bacteria can grow and fester. Plastic bowls and dishes are best avoided for regular use. Plastic materials can get easily damaged by hungry teeth, playful nails, or even in the dishwasher. These scratches or other imperfections can create perfect hiding spots for bacteria that could cause a bout of digestive upset or a case of cat chin acne if they're on the rim or inner sides of the bowls. Are wide, but not too deep. Have gradually sloping sides, rather than sides that rise up at a 90-degree angle — to avoid "corner traps" where it can be difficult for your cat to easily get at their food. Have non-skid padding or other surfaces on the bottom to prevent their bowls from "running" away from them. 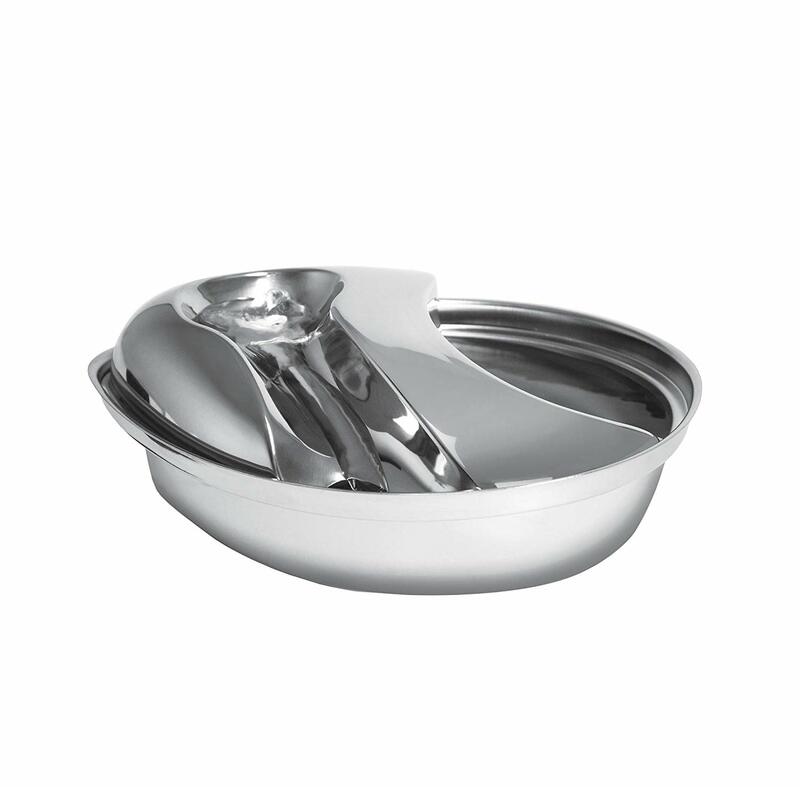 Here are some great and simple "basic bowls" that I recommend, and they're inexpensive enough for you to have a large supply so you can more easily rotate them out as you wash your cat's food dishes at the end of each day! A special note about "Whisker Fatigue," in case you've heard of it. It was all over the news in the summer of 2017. Whisker Fatigue is a (proposed) condition where a cat's sensitive whiskers, called vibrissae, suffer from nerve exhaustion due to repeated stimulation from hitting the sides of their deep and narrow food bowls. Is it real? Could your cat suffer from it? The answer to both is that it's possible, but right now Whisker Fatigue falls under the category of conditions that are not definitive, completely plausible, but not worth getting freaked out about (at least, not to the point of spending $60-plus on a special bowl). Any wide, low-sided, curved-bottom bowl (like those we recommended above) will work just fine for most cats. Learn more about whisker fatigue and the many other reasons why your cat could stop eating — and what you can do about it. Some cats are perfectly fine drinking from a plain ol' water bowl. But there are other cats that much prefer a random mug or water glass — you'll know if your cat is one of these if you wake up in the middle of the night to the sound of your kitty lapping up the water from the glass next to your bed! Other cats are entralled by the look, sound, and taste of running water — these are the cats that jump into the sink or shower after you're done to lap up the residual water as it drips out of the faucet. Since water (hydration) is so important to your cat's health, you really should provide them with multiple water sources. 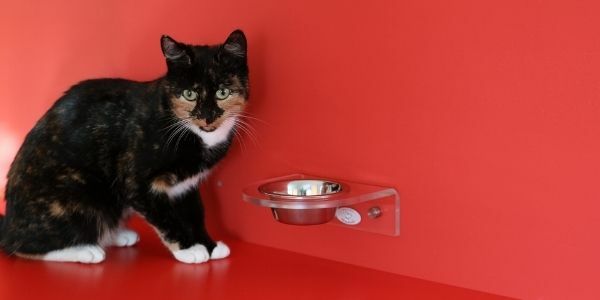 All cats should have a plain ol' water bowl or two laying around, and it's typically best if those are stainless steel (for the reasons outlined at the beginning of this article). If your cat likes to drink out of cups and mugs, leave out a few of those, too. And if your cat loves running water, but you don't like the thought of a super high water bill, consider getting a water re-circulator (a.k.a. "kitty water fountain") for your cat. 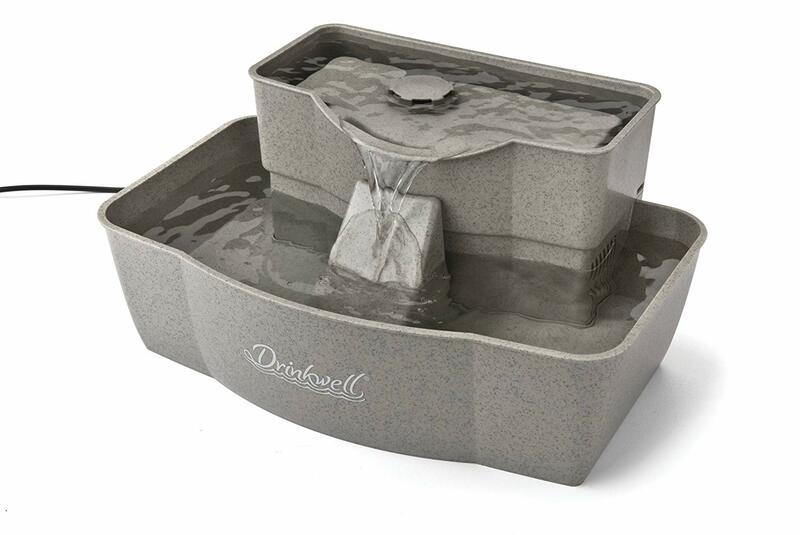 You can see our kitty water fountain recommendations below. Whatever you decide on for your cat's water "bowl" needs, just be sure to refill and clean them daily. Nobody likes stale water! 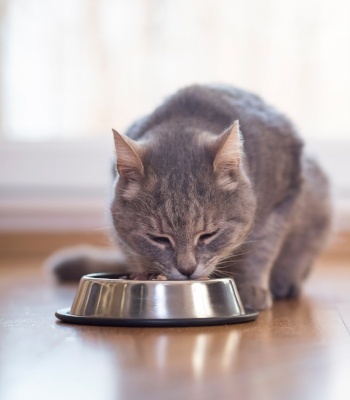 See below for tips (and a trick) on cleaning and disinfecting your cat's bowls and other feeding and drinking vessels. 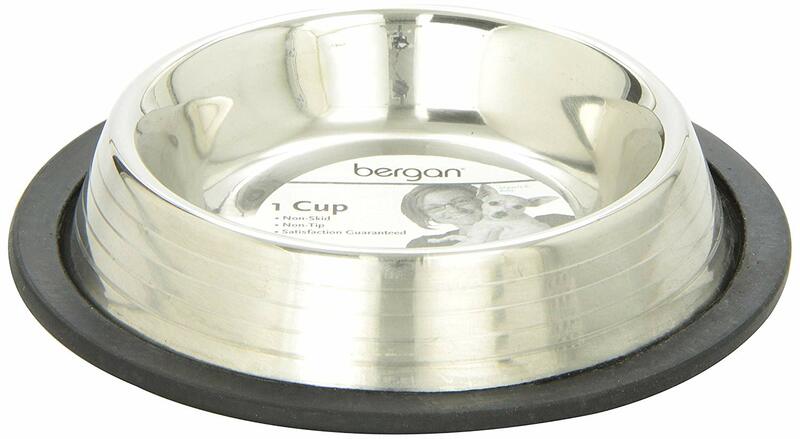 Sometimes the best food bowls for cats aren't actually bowls! Food puzzles — also known as interactive feeders, food puzzle toys, or puzzle feeders — can provide cats with important mental stimulation and entertainment (an important part of environmental enrichment for cats) and can also help slow down their feedings to avoid scarf and barf. Not all feeders are created equal, and not all feeders will work for your specific cat or home situation. Many food puzzles only work with dry kibble, though there are plenty that can be used with wet food. Most food puzzles and toys for cats are also mostly made out of plastic. This shouldn't be a deal breaker though. Just know that they can take a bit more effort to clean and disinfect (see some cleaning tips below). Interactive feeders can also be challenging in a home with dogs, or even multiple cats (although, they can be helpful to slow down any "food gobbler" cats you have so they’re too preoccupied to steal food from the other cats in your home). 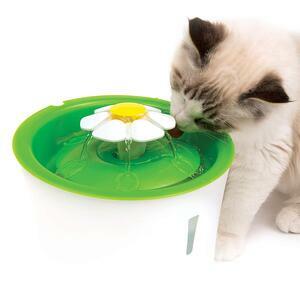 Ideally, you should clean your cats food and water bowls (or interactive feeder) every day. Admittedly, this is not always practical in a busy home. Try to clean as often as you can, but especially if you can see bits of caked-on food clinging to food bowls/feeders, or if your cat's water starts to collect a layer of visible saliva and/or cat fur. If possible, use the dishwasher to clean and disinfect bowls. If you choose to handwash, set aside a dedicated sponge for your pet bowls (you probably don’t want to transfer the gunk from pet bowls onto your human dishes, or vice versa). 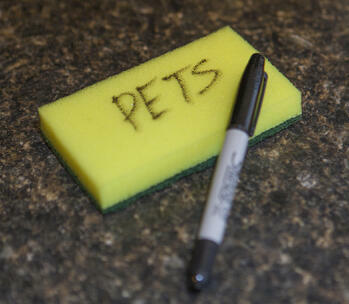 A trick I use to avoid confusing the sponges is to write “Pets” on one sponge using a Sharpie marker.